Along with the cool Fall air and changing leaves comes an abundance of squash to the markets. 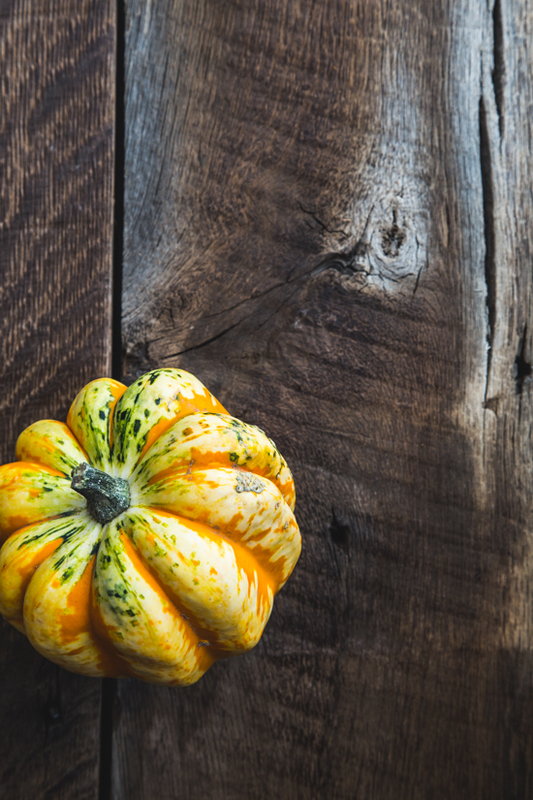 It’s hard to resist these colorful gourds, but figuring out what to do with them can be intimidating. 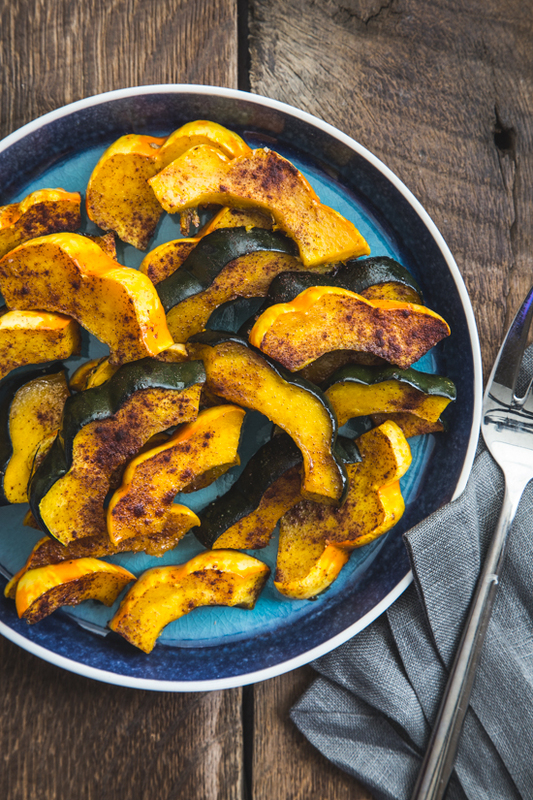 This Maple Roasted Acorn Squash is simple and sweet and perfect for any Autumn meal. Fall is here! I couldn’t be more thrilled to welcome the crisp air, thick sweaters and pumpkins as far as the eye can see. Pumpkins make me happier than I care to admit. Well, squash in general makes me feel that way. This week, the Sunday Supper family is celebrating all things Fall – with a day of Fabulous Fall Flavors. 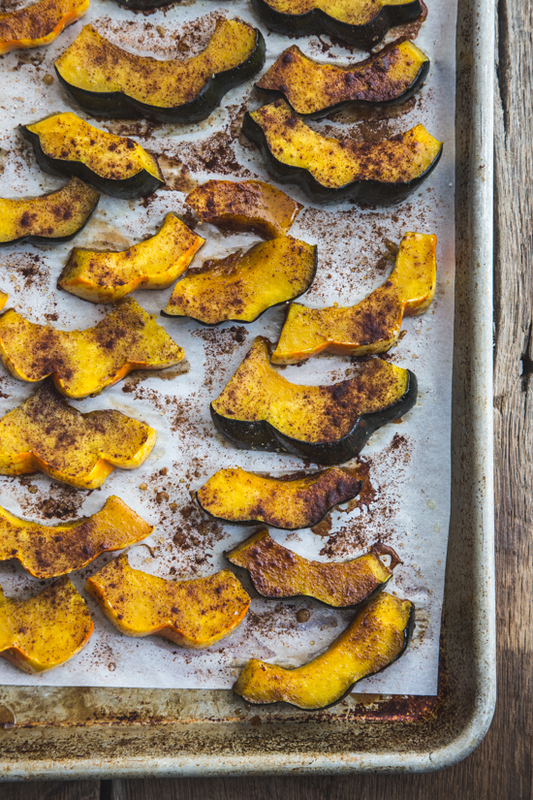 I knew I wanted to share one of my favorite ingredients on today’s table: squash. Everytime Fall rolls around, my husband grins and bears all of the nonstop squash cooking that I dive into. From butternut squash soup to squash apple bake to squash tartines – I can’t get enough. And I’m not even sorry when the compulsion hits me – it’s just too good! This Maple Roasted Acorn Squash encompasses everything that I love about squash – it’s ease of preparation and it’s inherent sweetness. 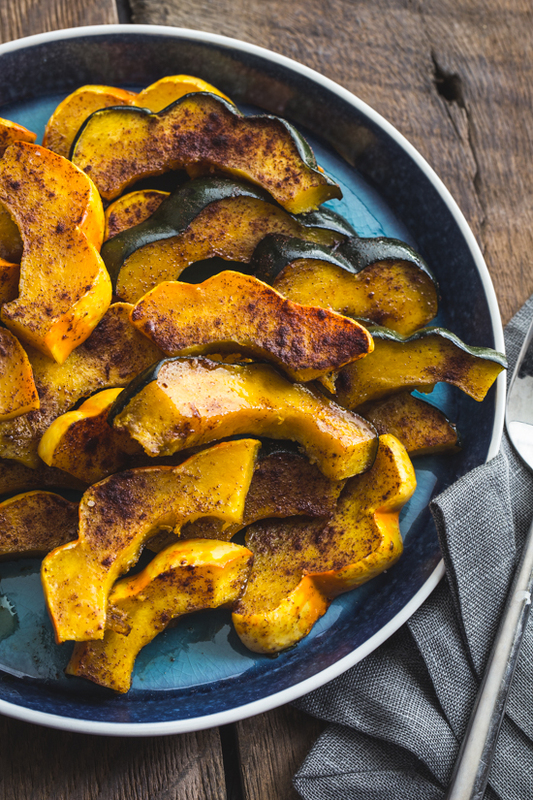 Maple syrup, a sprinkling of my favorite raw sugar and a dusting of cinnamon is all this golden acorn squash needs to be the center of attention at your dinner table. 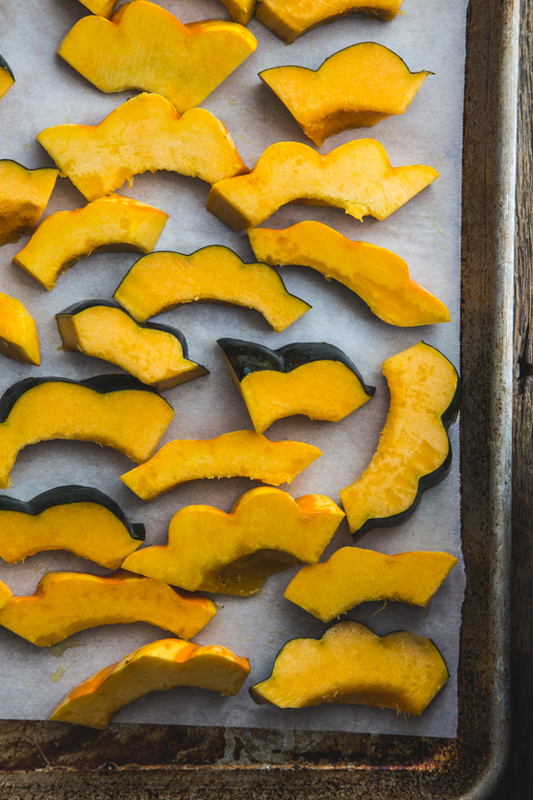 Side dish or not, this squash will impress! Next time you’re faced with the question of what to do with those mysterious squash overflowing at the grocery store – try roasting it! Looking for more Fabulous Fall Flavors? Look no further than the Sunday Supper Table! Roasted veggies are always flavorful with a drizzle of oil and soy sauce, But now I’ve got to try your wonderful idea of squash and maple syrup. Yum! This is beautiful. I have acorn squash sitting in my kitchen right now! Pingback: Fabulous Fall Foods for #SundaySupper! Yum! I love everything squash. Can’t wait to get my hands on a few! I think acorn squash is one of the prettiest squashes this season. The shape and color…I just love everything about it. A little touch of sweet sounds good with acorn squash! This looks like dessert! I’m always so tempted by those acorn squashes, but like you said, never know what to do with them. This looks like an easy first attempt! Acorn squash is my favorite variety of squash I think. I love the scalloped edges and the deep flavor. I could definitely turn this into a main dish. I have been buying up all the squash. I can’t wait to try this recipe. Yes!! Give it a try for sure, Amy! Don’t ever squash this passion!! I love the recipe. 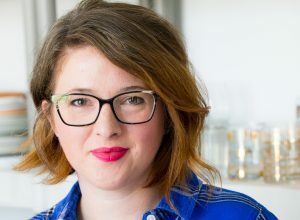 I just love the simplicity of this recipe Emily. It has my name all over it. Yummy! Why have I never tried acorn squash before? I should definitely correct that. Yours look so scrumptious! How gorgeous is this dish? WOW it makes me want to jump in my car and head to the store right now!! Pinning! 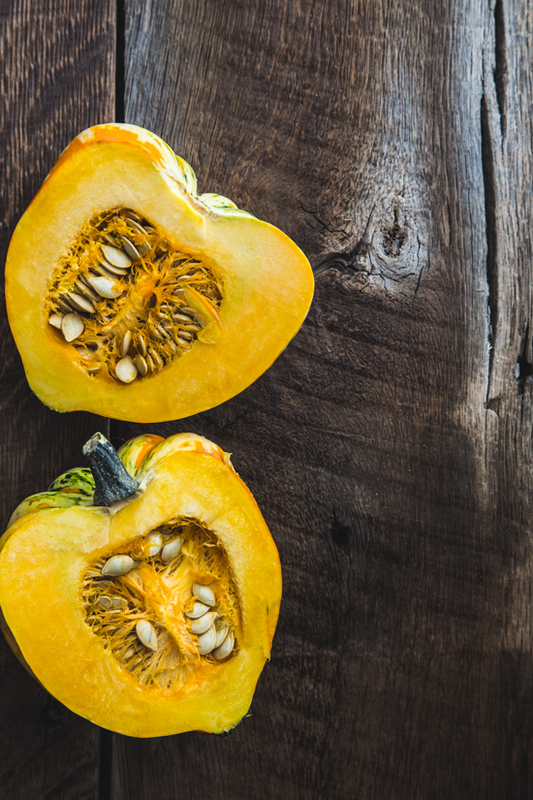 Wow – love the maple and acorn squash combination! I bet my kids would go crazy for this! Can I call it dessert? Fabulous share–I love roasting my sweet potatoes with maple syrup, so this recipe is right up my alley! Yay for the official start of autumn, and happy weekend to you, Emily! This tastes just like how my mother made it, and I could never seem to duplicate, until now! Thank you so much!